How do you do that? How are you able to keep track of my work? I’ve had several members of my staff wonder how I manage to keep track of everything they were assigned. How I was able to keep them all on their toes and not let things drop. Ultimately, how I was able to delegate and keep them accountable given the complexity of our work. Do you regularly delegate tasks to staff or assistants? Or your kids? Do you have meetings you attend where you may need to report back or followup on something that came up during an earlier meeting? Is your team being held accountable for work delegated to them? Do you struggle to keep track of what, by who and when things need to be done? I’ve had as many as 16 direct reports working on a cross section of multiple long-term projects. Each project with its own timeline, deliverables and collection of project meetings. Without a good system to keep track of who’s doing what, what’s been delegated and what needs followup in the various project meetings I’d lose my mind! The system I use to keep track of what tasks I have ahead of me, is Getting Things Done⁠1, commonly referred to as GTD. I also use it to track anything that’s been delegated or that needs followup in the future. If you are familiar with the concepts presented by David Allen in his book Getting Things Done you can skip this section and get straight to the details below. GTD at its core is a task management methodology. It can be implemented on paper or there are several applications available for desktop and mobile devices. A key feature of the system is the assignment of a context to each task on your list. The context is the situation, place or setting in which you would do that task. A simple way to implement this on paper is to have a different sheet of paper for each context. When you have a new task it gets placed on the appropriate list for the context in which you’ll do it. For example, I have one context called Office for things I do at the office. Another context is named Yardwork for stuff that I need to take care of the next time I’m in the yard. With this system, when I’m at the office I don’t need to scan past my tasks to repair the broken sprinkler or replace a dead tree. And when I’m ready to get into the yard, I have a list of only those things that I’ll be working on outside. While a collection of paper lists can work, I use OmniFocus, a digital solution for managing my GTD task list and workflow. What I describe below can be adopted to work in most any implementation of GTD. I will be giving specific structure setup based on OmniFocus as it’s the product I know. One thing to note, is that V3 of OmniFocus has renamed contexts to tags. I’m still using V2 on the desktop but have upgraded to V3 on my iOS devices. A common suggestion to manage delegated items in GTD is to create a @waiting_for context where anything dependent on an external action outside your control is placed. When you delegate a task to someone you set the context to @waiting_for. On a weekly basis it’s important to review that list to ensure that delegated items are moving forward. For general ad hoc items, I find a @waiting_for context sufficient. For example I place a task in my @waiting_for context when I mail-order something that I expect to take some time to arrive. Kickstarter projects are a great example of this. I have a project called Receivables that contains tasks for any Kickstarter projects I’ve backed, checks I’m expecting to receive for rebates, or anything else that I expect to receive at some point weeks or months in the future. Each of those tasks is assigned the @waiting_for context. Where I find a general list insufficient is in keeping tabs on tasks I’ve delegated to staff or assistants. I create a context for each of my staff and anyone else I work with closely on a regular basis. Generally these are people that I have a standing weekly meeting with. 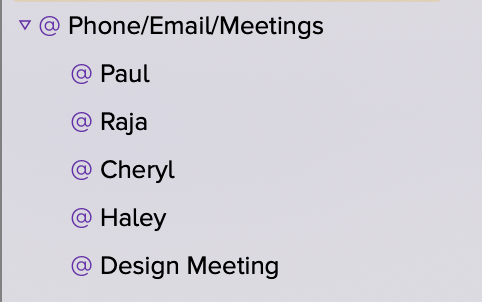 To keep things organized I have a parent context called @Phone/Email/Meetings. The context for each person is placed under this parent context. When I don’t have a specific context for someone, I use the parent context for the task. On the project side in OmniFocus, I find it best to avoid using a Sequential project to hold tasks that I’ve delegated. I prefer to use either a Parallel or Single Action project type. 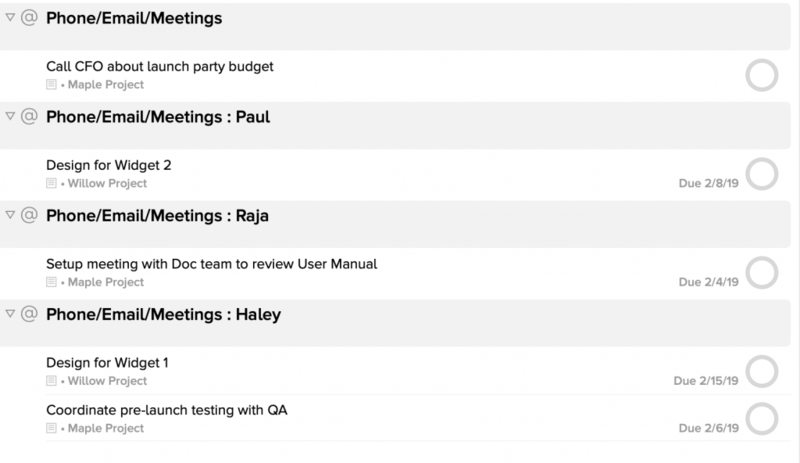 If I’m running a project that has several staff assigned, each with some delegated tasks, the tasks are then all visible in their respective context views. When I’m in a 1-on-1 meeting with a member of my staff I bring up their context. I have easy access to everything I’ve delegated to them. During the meeting, I use the Quick Entry shortcut in OmniFocus to quickly create new tasks for any new followup or delegated items. I use the same process to track items that I may want to raise or that require followup during meetings I attend. Before the meeting I review what items I have assigned to that meeting context. I’m then prepared to address any of my concerns during the meeting. Using a context for each meeting or staff member has helped me keep tabs on what’s happening on multiple projects. It helps avoid things falling through the cracks. Most importantly, it enables me to consistently hold my staff accountable to meet our team goals. As long as the delegated task makes it into my system, I’m able to followup to ensure that anything that does get dropped is done so intentionally. 1 Getting Things Done and GTD are registered trademarks of the David Allen Company. Want To Be Notified About New Articles?